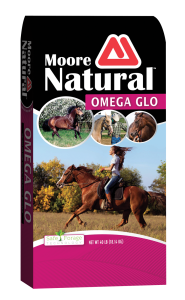 Moore Natural™ Omega Glow is a high-fat stabilized bran conditioning supplement. This supplement is a coll source of energy with reduced starch. Specially formulated with Safe Forage™ Technology and designed to be rich in calories for hard keepers. High-fat stabilized rice bran conditioning supplement. Source of cool energy with reduced starch content; suitable for horses prone to tying-up. Contains ground flaxseed, source of omega-3 fatty acids. Stabilized and extruded to prevent oxidation. Rich in calories for hard keepers to aid in muscle-building and weight gain. Highly digestible source of fat and fermentable fiber. Extruded nugget form, no sorting and wasting of ingredients. *Please contact Thomas Moore Feed for detailed feeding and management advice for horses with metabolic and other health challenges. Stabilized Rice Bran, Wheat Middlings, Flaxseed, Heat-processed Soybeans, Soybean Oil, Soybean Hulls, Calcium Carbonate. Thomas Moore Feed is proud to bring you Moore Safe Forage Technology™. For more than 150 Years, the Moore Family has been farming hay and grain in the naturally nutrient-rich Brazos River Bottom, and now they are delivering a new and unique forage-based nutrition technology to the Texas performance and pleasure horse markets. Rather than adding roughage co-products to your feed for the sake of meeting a fiber specification, they have invested in and delivered a carefully grown, tightly managed, high quality forage technology. Moore Safe Forage Technology™ is designed to deliver high quality soluble fiber, which is the needed substrate for proper hindgut function, resulting in greater conversion of the overall daily diet into natural, safe and efficient energy for horses of all classes. Throughout evolutionary history, it has been vital for horses to continuously consume and utilize forage as the mainstay of their daily diet, and now, Thomas Moore Feed is bringing nature back to the horse, in the form of Moore Safe Forage Technology™. KER Micro-Max™ micronutrients are designed to deliver the optimal amount and proper balance of critical vitamins and minerals to each class of horse for breeding, growth, performance, and overall health. When used as directed, Thomas Moore equine feeds containing Micro-Max micronutrient blends will deliver the nutrients horses need to complement the forage portion of the diet. Utilize the KER MicroSteed™ – Ration Evaluation Software to generate a Moore Natural™ feeding protocol tailored to your horse! Click HERE!